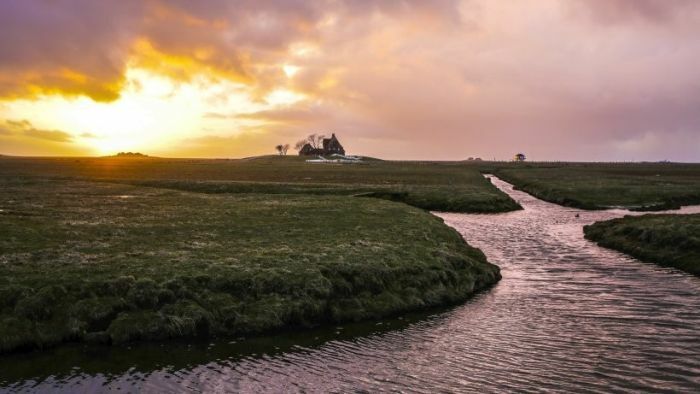 The Halligen (singular Hallig) are ten small German islands without protective dikes in the North Frisian Islands on Schleswig-Holstein's Wadden Sea-North Sea coast in the district of Nordfriesland. The name comes from a Celtic word hal, meaning "salt", a reference to the low-lying land in the region which is often flooded over with saltwater by the tides. A greater number of Halligen existed in the Middle Ages than in the 21st century. The very existence of the Halligen is a result of frequent floods and poor coastal protection. The floods were much more common in the Middle Ages and coastal protection was much poorer. A look at the maps on this page will demonstrate that this part of the North Sea coast is very much at the sea's mercy. The Halligen have areas ranging from 7 to 956 ha, and are often former parts of the mainland, separated therefrom by storm tide erosion. Some are also parts of once much bigger islands sundered by the same forces. Sometimes, owing to sediment deposition, islands have actually grown together to form larger ones. Langeneß (or Langeness) includes a former island by that same name, and two others that were called Nordmarsch and Butwehl. Dwellings and commercial buildings are built upon metre-high, man-made mounds, called Warften in German, to guard against storm tides. Some Halligen also have overflow dikes.